Rob Ford surprised nobody with grandiose statements made on day one as Mayor. He announced that he's canceling the Transit City LRT construction plan so the city can concentrate on building subways. Sure, we've already spent millions of dollars and new subway lines might not be finished until 2020, but Rob Ford's stopping wars. Transit City is over, ladies and gentlemen... the war on the car stops today. This was day one. It's going to be a very interesting time, and I'm just wondering how long it will be until this idiot implodes or our city explodes. I still can't believe we voted this guy in when everyone I know who likes him lives in the 905. But wait, can Rob Ford actually do what he says he's done? Can he kill Transit City on his own? Nope. But Ford's proclamation on Wednesday does not seal the fate of the transit plan, which was seven years in the making. Ford acknowledged that in order for him to fulfil his promise of putting an end to Transit City, he would need council's support. "Everyone's going to have a discussion on that, but I'm the mayor of the city, I have to lead by example, and that's exactly what I'm doing," he said. When asked how he would persuade council to support him, Ford said: "That's up to the councillors." Meanwhile, I'm wondering exactly how much gravy was on that train Rob Ford kept yakking about. Ontario Transportation Minister Kathleen Wynne has said that $137 million has already been spent on the project, and an additional $1.3 billion committed in Transit City-related contracts. That's a lot of gravy! How many of you with home addresses in the 416 sincerely believe Rob Ford is the best man to lead this city? In Toronto's Parkdale region alone: much of Roncesvalles Ave is now reduced from four lanes to two, Lansdowne Ave is also reduced. St. Clair Ave is reduced to accomodate its LRT-lite line which still requires it to stop at every road intersection with added extra left turn lights to further hold up its thru traffic. 'The Queensway' south of High Park has been reduced from six to four lanes, also with a dedicated and curb raised (half a foot) streetcar only lane. Don't forget about the approved and some already being constructed newer buildings. Sure development is needed and can be fitted. But not while the main arterial roads are reduced and townhouse laneways are neglected as a pittance. Try navigating along the billion dollar ghetto known as the Humber Bay area of Etobicoke. The place is an illegal parking lot (and seniors' walking club) every weekend. Good luck finding an easy to get to school or supermarket from there. And everybody can work at the financial towers as leading executives while unseemly back office functions continue to get pushed out of the high cost Toronto core. Factories, of course, are already long gone. Remember the street furniture which stood like monoliths? Like a simple garbage bin isn't acceptable? Fast food and coffee containers are rarely if ever recyclable - and that's if they aren't mostly and quietly dumped anyway away from out precious GTA. How about the spring 2010 paved 2 km trail upon the railway corridor (over an abandoned slopey line) from Dundas/College upto Dupont - just as the rails are to be intensified with a high speed service straight to Woodbine Mall & racetrack (oh boy!) and then back down to the airport, from the depths of Union Station? Dual plans are in place to continue this trail towards the CNE rail branching. Try walking along Bloor Street into the downtown core? Then look out for any falling air conditioners or flimsy satelite dish installations from the newer low to midrise co-op buildings directly over the sidewalks. Then there is the re-formed path corner entrance into High Park with glass mixed gravel at Keele plus a bland pair of low walls to replace the decorative to look at modest fountain pool. FYI, there's no 'High' letters installed - just 'Park'. Or you could stroll along the south side of the park and pond which received fancy pavement and cement area benches - which overlook the new 10 or 12 feet high growth of thick reeds and weeds along the pond's edge (and hope a car doesn't happen to drive over the curb and down into the embankment either. New condo towers with added townhomes directly against the Gardiner highway across Windermere and Ellis means the main highway will be locked into its exact configuration permanently. No widening, no re-routing. You want to know where the real gravy is, Mike? It is in the pockets of "publicly" unionized city workers, managers, and executives mutually receiving well above marketplace compensation. Just last night TVO Agenda discussed other places like Italy and Ireland where socialists would drive up their national debts and then need to drop their pre-Euro currencies to effect a massive scaleback of gov't pay. Now watch the distraught [awwh!] socialists of places like Greece and France screaming daily over a retirement age past 60. Good heavens, no, dear god no! Don't think that our city workers are somehow special guests at the wages and pensions dining table either. A number of the USA's individual States and major cities share and can also firmly compete with our own socialist bankruptcy pressures as well. CQ for Mayor! Seems you know ALL the issues. Do you have ALL the answers? Or are you just another right wing whiner blaming all things past and present on the Unions, Liberals, NDP, the church and your dog? Mike, it's seems Ford has already found his excuse for failing all his pre-election promises in his inaugural speech. NO ONE (councilors) WOULD WORK WITH ME! The Ford supporters will say this is a brilliant move against the socialist left and the gravy train will stop. It doesn't even apply here but that's what they'll say. Cancelling this project will cost a fortune and it will be for nothing but posturing and a show of control. This is the first thing Ford wants to do? What could happen is this.... Ford gets Transit City killed and Toronto pays a lot in broken contract fees. 2010 and early 2011 look bad on the books but Ford can blame Miller. Next year when all of this dumped money is a memory and nothing is actually being built the city will appear to be saving money. Ford will claim a victory and that the Gravy Train has stopped. Of course the transit issue will be a big problem and the downtown core will be a mess, however, the Ford supports outside of the core won't care. Ford wins again. If Mayor Ford succeeds on half of the items of his plan, Toronto will be much better off. I mean it coudn't be any worse off than the shambles Mayor Chow Mein Miller and his gang of losers left behind. Hey Ford Bashers out there, you ain't seen nothing yet!!! Showing a cartoon depiction of Mayor Ford as a cannonball is beneath you. I know you think obesity is funny but if he was black would a picture of an Aunt Jemima character with Mayor Ford’s face be funny to you? Or if he suffered from Mental illness a cartoon picture of a 'crazy' patient with his face on it, would that be funny? If George Smitherman had won like he thought he should win, would you have posted a cartoon of Liberace with Smitherman's face on it? I think not. You know why you posted that picture so don’t try to justify this. Being upset with Mayor Ford’s agenda is one thing, but making fun of his affliction is not funny. You are better than that Mike. The answer to your questions is...47% of whatever the number of people who voted is...That is a huge majority for any election so, I suspect that, while the minority whines, Ford has the support of the city. @Jeff In what math system is 47% a "huge majority"? 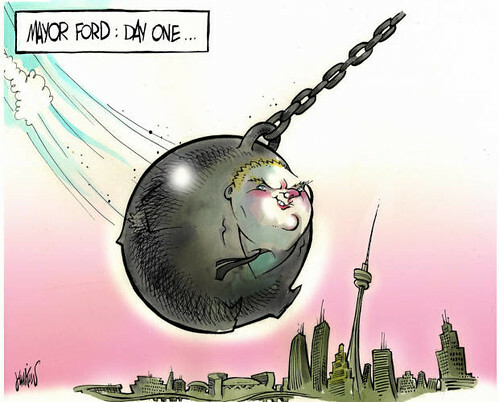 The cartoon ran in the Globe and Mail and the cannonball reference had nothing to do with his weight. I don't think a single 416er has chimed in to defend this guy. How did he get the votes? @ Ian - it's not a math system that's being talked about. It's an election system. And in our system 47% is huge, expecially with the voter turn out numbers. If you don't believe that number, how about Rob Ford getting the most votes every in any one elction in Canadian history? I voted for Ford but don't for a second think that he's the ideal canidate. But he was the best of bad lot and this city needs change. Whether he does enough or the right thing who knows. I do know we'll get to decided that @ election time. I do have to admit though. I find it weird that all the lefties are complaining about wasted tax dollars if Transit City is killed. If they should this sort of concern while they were in office they may still have had a job today. BTW I know there spelling erros in previous post. And btw Mike 383 501 416ers voted for Ford. @Ian - In the electoral system. 47% of the vote is a huge mandate. Try paying attentin to recent and subsequent elections. Parties usually get less than 40%. TOMike @10:27: "I don't think a single 416er has chimed in"
-huh? well thanks for glossing over my rant reply, lol. Mike from Lowville: Maybe? maybe, lol? A firm example lockout against the TTC is needed to avoid excess firings beyond trimming down against its fewer numbered bloat positions and overdue modernization efficiencies. A wildcat strike was widely esteemed as fair and so was its follow-up '90 minutes to Midnight warning' legal position strike with so many youthful college aged citizens stranded in the downtown on a Friday night shortly after their schools' Spring semesters ended. Not that gov't workers are unique: see GM and Chrysler plus Ontario's steel sector for workers who squeezed their employers' pockets too tightly within an int'l marketplace. Look at the newly made scam consultants who exit with their own clutch of me-first benefits as employees, then turn around to perfrom the same work as an even better paid independent. And look at their employers who okay these sweetheart deals while booting out their numerous other lumpers & grunts. Try people (some like myself, yes) who never see their hydro bills as part of a rent and/or buy always-on energy guzzling appliances, some with clock timers*, and afterwards complain about both coal generated smog and their finally less subsided hydro costs. *My PC uses a tiny battery (which lasts for years) and shuts off - why doesn't my DVD player or Microwave? Too many organized right wingers only talk big and see value in nothing! I see good value(!) yet that just isn't worth its deficit-loaded price level. Darn it, I'm ranting again. Parts of Transit City need a rethink. For instance, the proposed Sheppard East LRT will force people to transfer from LRT to subway in the middle of the Sheppard Avenue East corridor. It's simply not functional. The Sheppard subway should be completed to Scarborough. A lot of people use the stub which has already been built. Transit city would force some commuters to use a combination of bus, subway, and LRT all along one street: Sheppard Avenue. Much of Jane Street is too narrow for LRT in the middle of the street. And Eglinton's LRT is supposed to be partly below ground, but it will still operate in the middle of streets for most of its length, allowing accidents at intersections to compromise service. (And accidents are common at intersections on Eglinton.) It should be fully grade separated. @Graeme - Thank you for pointing out that this isn't the biggest mistake the voters of toronto have ever made. Perhaps now the lefties can relax and let Ford do his job. If, say in four years, he hasn't done a good job, stand up, be counted and vote him out of office. Simple. Or, you could just maintain your status quoe and keep on whining - even before you have cause. Well, I sure didn't vote for Ford, neither did my personal trainer. We're both George Smitherman supporters. He would have been much better. I'm already sick of this gravy train business. Things are going to be a disaster. I'm damn near in your front yard and me, my wife and her Mom, our next door neighbour all voted for Rob Ford. I'll wait and see what he does, it took Miller a few weeks to start screwing up the city more than the dufuss he replaced. CQ, you said it all pretty damn well. I could only add: The intersection of The Queensway and the South Kingsway. Only Miller and his band of merry dumbarses could have taken the one working, busy intersection in the city and break it to the point where someone will die there. Last thing, TOMike, Mayor Ford actually has at least 2 votes, as my wife pointed out, his brother makes up the other half of Bob and Doug. He can't kill Transit City like Rob Ford won't win on your watch? Well, my personal trainer and I both voted for George Smitherman. There you go. It would have been better if Smitherman won. Let's hope he'll run four years from now.